The 2016 MTV Video Music Awards are officially here, and you know what that means—major red carpet fashion. In addition to all of the trophies given out tonight, we'd like to take the time to give out our own unofficial awards to the best dressed stars. Who better to start with than Queen Bey herself? The singer stepped out in a feathered and beaded gown from Francesco Scognamiglio Couture, complete with an angel-like winged collar that legitimately made us swoon a little. 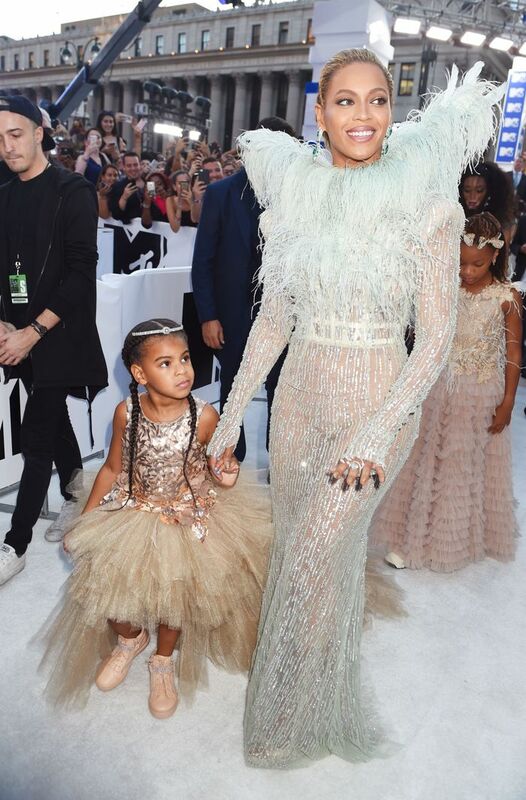 Even better than her look, however, was the way she adorably matched with Blue Ivy Carter! Young Blue wore a similarly bedazzled and textured princess gown. The best part? Mom and daughter both donned Lorraine Schwartz jewelry. These two are serious family #goals. Keep scrolling to see their matching looks for yourself! On Beyoncé: Lorraine Schwartz jewelry; Francesco Scognamiglio Couture dress. On Blue Ivy Carter: Lorraine Schwartz jewelry. How do you feel about their looks? Sound off in the comments below!